A massive field of 14 sophomores will travel 1 1/8 miles on the main Keeneland surface in Saturday’s $1 million Blue Grass Stakes (G2) . This key prep will offer points’ on a 100-40-20-10 basis on the Road to the Kentucky Derby (G1), with the top two-finishers likely to move on to the Run for the Roses on May 4. This win contender led throughout in a facile victory in the Jeff Ruby Steaks (G3) at Turfway Park most recently. The talented sophomore has speed and the rail as a wire-to-wire contender at fair odds. The 9-5 morning-line choice had a good prep for this event when third in the Fountain of Youth Stakes (G2) at Gulfstream Park . Grade-3 winner will be formidable with improvement second time off the layoff. The Kentucky Jockey Club (G2) victor was seven lengths in arrears in the Fountain of Youth in his seasonal bow. The late-running Kentucky-bred was runner-up in the Breeders’ Futurity (G1) in his prior Keeneland performance and is working rapidly in advance of his local return. The Rebel Stakes (G2) third is steadily improving in preparation of his this graded test. The Kentucky-bred will vie for the lead early on and could hang on for a piece with a step forward. Owner: Estate of James Coleman Jr. This recent maiden winner takes a huge class hike in his second two-turn try. The bay colt would be a surprise facing winners for the initial time. The talented three-year-old lacks consistency but is more than capable on his best day. The Tapit colt sizzled a bullet half-mile in :46 from the gate here in readying for this assignment. This $300,000 yearling purchased was unplaced in the Tampa Bay Derby (G2) and Withers Stakes (G3) from a pair of 2019 outings. 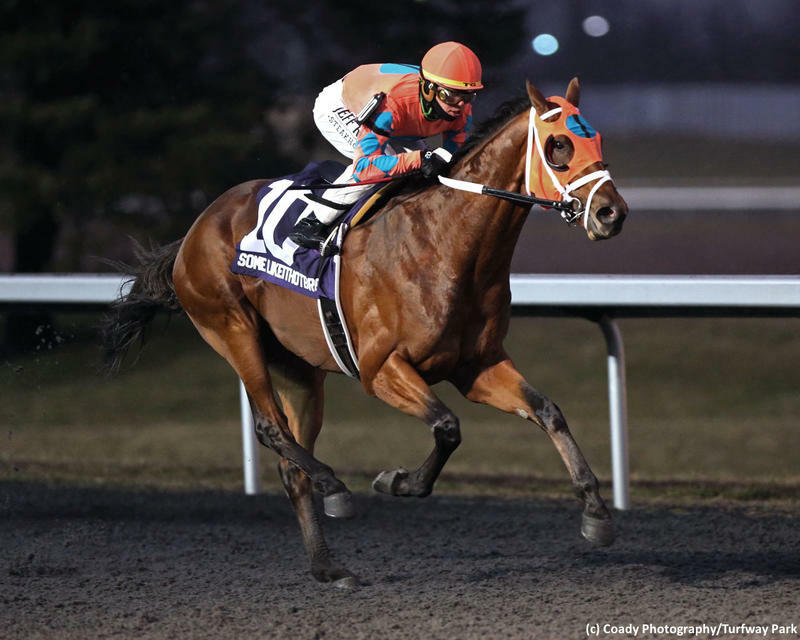 The Kentucky-bred could challenge for a top-three placing with improvement in his local debut. The 7-2 second choice set a track mark in the Pasco Stakes two back, prior to rallying for a third-place result in the Tampa Bay Derby (G2) last out. This win contender has won or placed in every lifetime performance and keeps Irad Ortiz Jr. in the silks. This sneaky contender closed belatedly in both the Withers and Tampa Bay Derby from two outings this campaign. The homebred should offer his best making a third run off the layoff at a big price. The Withers seventh didn’t impress in his stakes debut last out, though he figures to move forward second time out this year. The Flatter colt has early foot and will be forwardly placed in his Keeneland bow. The Kentucky-bred was a winner on debut at Keeneland in the fall when putting in a big late run en route to victory. The bay was a distant third in the Sam F. Davis Stakes (G3) in his latest showing and will need a big step forward in the Blue Grass. This $400,000 two-year-old purchase will look for his initial win in his ninth career start. The gray colt was outrun in the Rebel Stakes last time but faces a more reasonable field in his second graded attempt. The Keystone State-bred could challenge for a placing with a lifetime best. This one-run closer has been beaten by double-digit lengths in his last five races on the dirt. The outsider will need a total pace collapse to make an impact against this cast. This developing three-year-old has shown improvement since stretching out two races prior. The sneaky contender has early speed but must get a sensible trip drawing widest of all in the field.